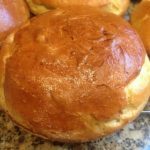 This light brioche burger bun recipe is adapted from Comme Ca Restaurant via the New York Times. In a glass measuring cup, combine one cup warm water (110-115 degrees), the milk, yeast and sugar. Let stand until foamy, about 5 minutes. Meanwhile, beat ONE egg. In a large bowl, whisk flours with salt. Add butter and rub into flour with your fingers until the flour looks like crumbs. Using a dough scraper, stir in yeast mixture and the beaten egg until a dough forms. Scrape dough onto clean, well-floured counter and knead, scooping dough up, turning it, until smooth and elastic, 8 to 10 minutes. The dough will be on the sticky side so it can be a bit messy but keep in mind that the more flour you knead in, the tougher the bun will get. Line a baking sheet with parchment paper. Using dough scraper, divide dough into 8 equal parts. Gently roll each into a ball and arrange two to three inches apart on baking sheet. Cover loosely with a piece of plastic wrap lightly coated in non stick spray and let buns rise in a warm place for one to two hours. Set a large shallow pan of water on oven floor. Preheat oven to 400 degrees with rack in center. Beat the remaining egg with one tablespoon water and brush some on top of buns. Sprinkle with sesame seeds, if using. Bake, turning sheet halfway through baking, until tops are golden brown, about 15 minuters. Transfer to a rack to cool completely.